¡ Bienvenido a la página del Laboratorio de lenguas de BCC: “FRED” ! Spanish students at BCC must spend one hour a week in FRED working on collaborative projects, recording audio or video voicethread projects, making PowerPoint learning games or flashcards, or doing online homework. We encourage you to come work or hang out in FRED in between classes. You will find you learn so much more if you set out small learning tasks for yourself that you can accomplish in small blocks of time. Make certain to sign in when you arrive so that you earn credit for your time in the lab. 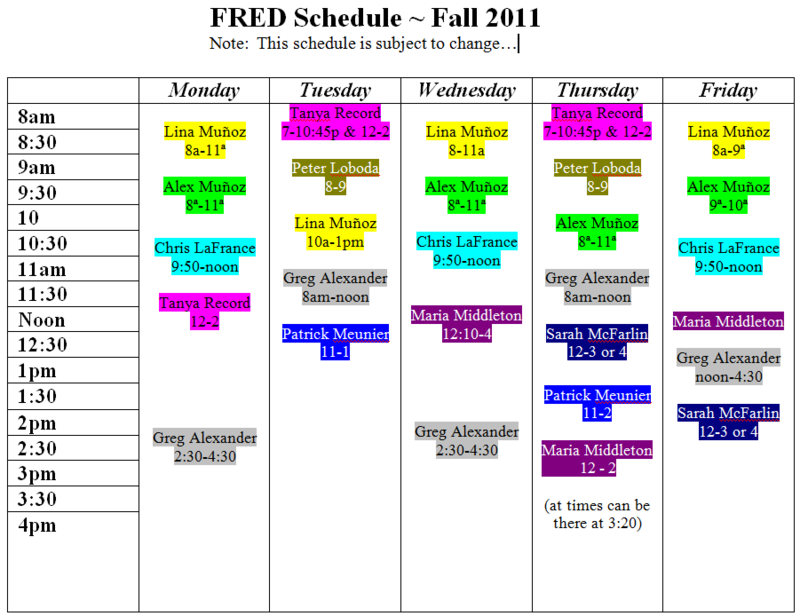 Click on the image, below, for FRED hour with FRED Facilitator’s schedules. Study Groups meet at the times, below. Leave a message, below, telling us which activities and resources you would like to see in FRED! This entry was posted in Uncategorized and tagged FRED by Lois B. Cooper. Bookmark the permalink.